Now the dust has settled on the election, let's have a look at the unmitigated disaster that was the Leicester South by-election. This by-election was held on the same day as the local elections and was contested by Abhijit Pandya who became a legend in his own postcode by calling Islam a degenerate religion and calling for muslims without a work ethic and who refuse to integrate to be deported. The Leicester Mercury picked up on his comments and took the unusual step of advising readers against voting for him. He responded by turning up to the Leicester Mercury's office on the Sunday morning of a bank holiday weekend with a camera and interviewed himself outside complaining that the editor and reporter weren't there to answer him! One person involved in the election campaign described it as the worst campaign they'd ever been involved in, said that Pandya was hardly involved in the campaign and that people were coming in off the street to abuse staff in the UKIP "shop" in Leicester because of what he said. This by-election cost the best part of £24k and Pandya picked up 994 votes. This is an increase of just 274 votes over last year's general election where UKIP came last. But there were 6 candidates last year and only 5 this year and one of them was from the Monster Raving Loony Party who, incidentally, got about 60% of UKIP's vote. 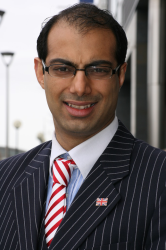 The seat was unwinnable anyway but the extent of our loss in Leicester South was down to Abhijit Pandya who, despite defending his comments at the time, has since removed them from his blog. Twenty four grand and a disgruntled, diheartened campaign team too late. So what now for Abhijit Pandaya? He is, to the best of my knowledge, still UKIP's head of research and advisor on community cohesion. This position is not tenable in light of his appalling lack of judgement. How can he advise the party on policy and public opinion when his opinions are so repellent, people actually went out of their way to find the UKIP shop to abuse volunteers over them? By all means let him stay on as a member - I'm sure he has redeeming features - but he should not be advising UKIP on policy.